Are you familiar with Jergens lotion? If you’re like me, you probably grew up with some variant of Jergens lying around your house. My mom is a huge fan of this brand as it’s very mild and yet quite moisturizing. I took after her and started using Jergens starting from my teens. I’ve tried other brands of course, but there’s nothing like the “basics” to get my skin back to its youthful glow without getting my sensitive skin worked up. This is why I didn’t hesitate to take up the 7-Day Challenge that Vibelle set up! It was a very intriguing activity and I was even more pumped when I received my challenge kit (below). I will be updating this post with the challenge for the day and what I did. Keep your eyes peeled! I am so tickled with the “Mission” part! It really feels like I’m some sort of secret agent! Anyway, this mission is to radiate beauty from within by sharing the bottle of Jergens lotion from the challenge kit with a complete stranger. I will be completely honest: this is probably one of the hardest things I can be challenged with. I have big stranger anxiety and I couldn’t find a good way to approach a stranger for this challenge. I did the next best thing: I gave my bottle of Jergens lotion to the person in the office I feel the least connection to. Meet Sheila. She is the company cleaning lady. I chose her because 1) I feel that I don’t know her that much and 2) this is a great way to appreciate her work, with a gift. I shyly asked if she would be okay accepting the gift and posing for a picture. As you can see, she was quite ecstatic to receive it, and was a quite tickled with having her picture taken. I’m happy I chose her; it seemed to have made her day! 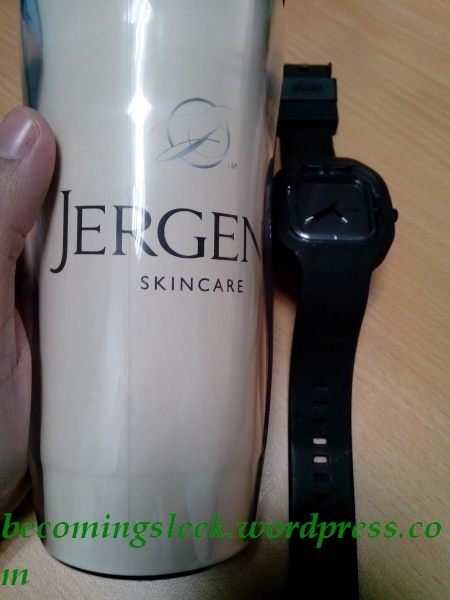 Today’s mission is to compare skin that has Jergens applied on versus skin that is bare. I used the Jergens Ultra Healing lotion provided in the challenge kit. This lotion has an illuminating Hydralucence blend and Vitamins C, E, and B5 to address extra dry skin. This is actually my go-to Jergens variant, and I felt quite nostalgic when I took in that familiar clean scent. As you can see here (click the photo for a larger version! 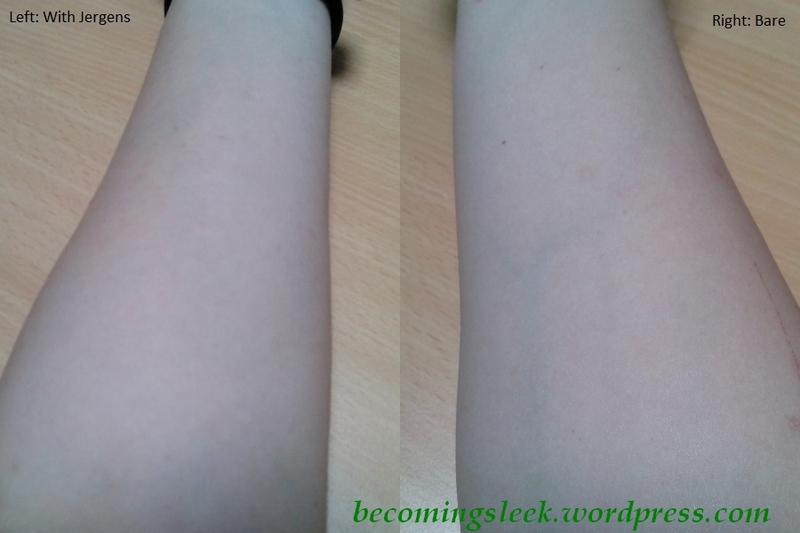 ), my left arm (where I applied the Jergens Ultra Healing) is very luminous, alive, and smooth-looking. In contrast my bare right arm looks really tired and absolutely dry. I really love how immediately obvious the effects of the lotion is by making my skin look more alive. This mission sounds pretty straightforward: using the tumbler included in the challenge kit, drink water and take a photo of the tumbler every time it gets refilled. Hydration is the name of the game! Keeping hydrated is a great way to hydrate the skin which will then result into healthier and more glowing skin. I, however, found it quite the challenge! 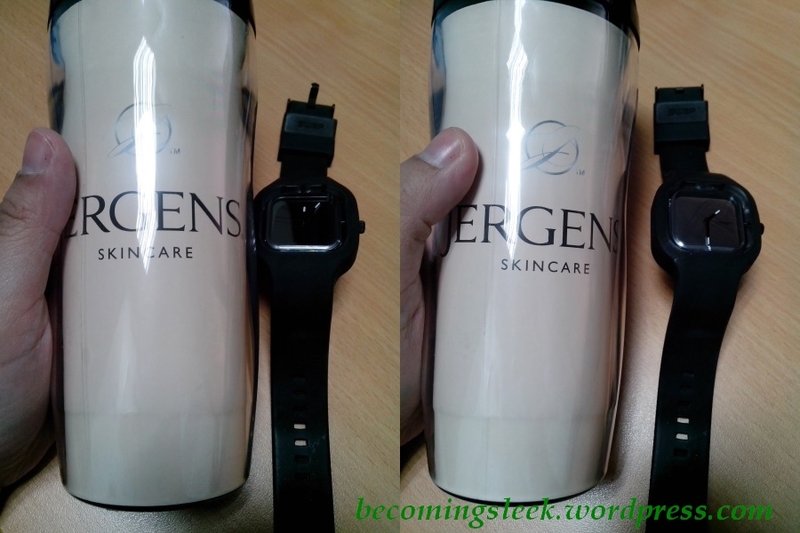 Firstly I couldn’t figure out how to put timestamping on my camera, so I just.. put my watch next to my tumbler. The second and more difficult challenge is not drinking anything else for this day! I’m not a soda drinker by any means, but I am an avid coffee drinker. I could not properly function without a cup, but I took the challenge and drank only water! Here are my photos. I didn’t really think it was difficult to drink water, since I drink a lot of water everyday. The challenge of not drinking anything else (coffee in particular!) had me stumped, and to be honest it did affect my mood for most of the afternoon. I felt lethargic and irritable at the same time, which made me realize just how dependent I am to that drink. My skin, on the other hand, never felt so nice with all the extra water I’ve been drinking. I am loving how many insights I am getting with these challenges! This mission took a while to execute because of some logistics issues. I am tasked to take out my mom or my best girl pal on a surprise dinner at Cabalen care of Jergens. Unfortunately my mom is out of the country at the moment, and my gal pals are not available. I took my best friend out instead. It just so happens that I married my best friend! My husband and I have been together for 14 years (gasp!) and married for 9. One of our favorite things to bond over is food, so this mission just seemed so apt. We had a great time at dinner as usual, and I definitely appreciate this chance to try out Cabalen. 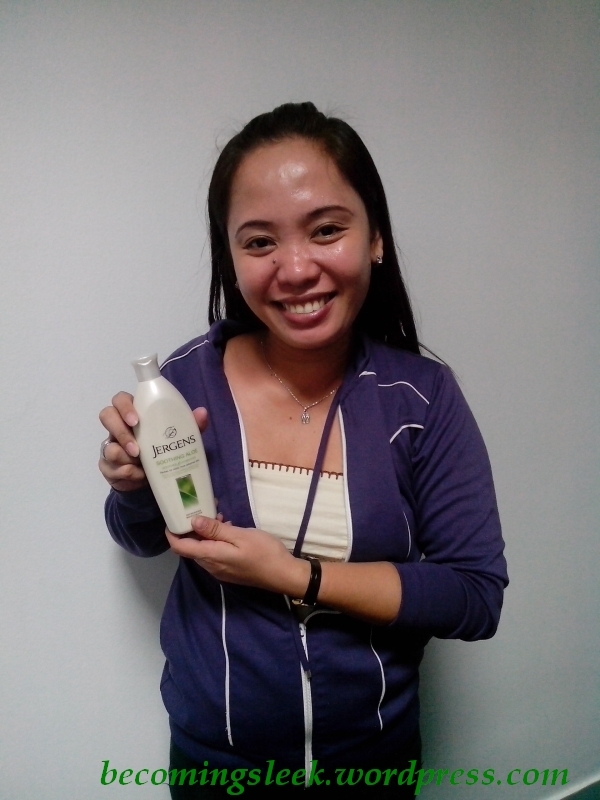 Thank you Jergens! Jergens would like you to smile! 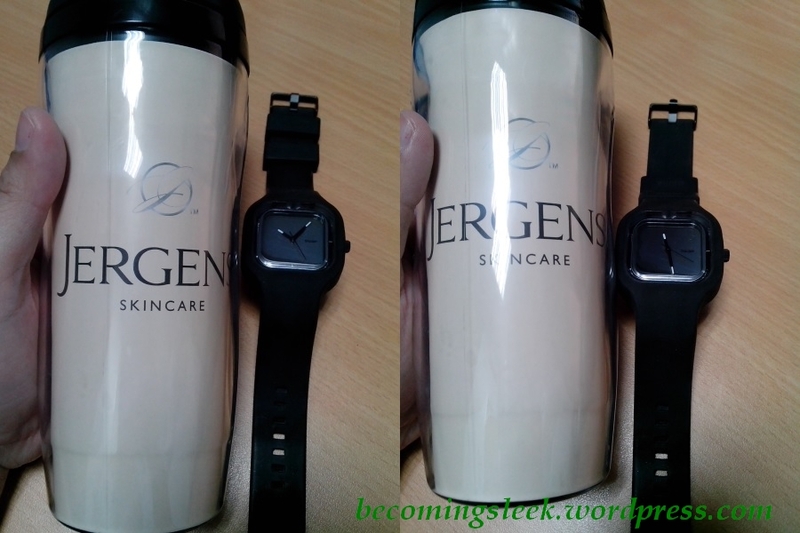 They are graciously giving away a Jergens gift pack through Becoming Sleek. Click here for the actual giveaway and you might win yourself a Jergens gift pack! This mission gives me the opportunity to share with you one of my favorite healthy recipes that includes an ingredient good for the skin. I’m supposed to share a family recipe but I don’t have many of those (my mom isn’t the cooking type unfortunately). I learned this recipe on my own, as with most of the recipes I know. I got this from a book called Just Bento, and I even published a blog post way back when I was still doing food blogging. This recipe of Stewed Chicken and Carrots contain, well, carrots! Carrots have beta carotene, which gives us Vitamin A and is also an antioxidant, both are good for the skin. Without further ado, here is the recipe! PS: This was copied word for word from my food blog, Baon Ko Bento. I just dumped everything into a bowl and mixed them all up until they resemble a very smooth but slightly wet paste. I didn’t have any ginger on hand (the original recipe calls for about half a tablespoon of it) so I simply omitted it. I don’t know what was wrong with my ground chicken, but it does look like it’s too wet to hold solid when dropped into the broth. Anyway, once I had the chicken mixture ready, I mixed up the broth. I just put the broth ingredients into a large sauce pan, brought it to a boil, and dropped teaspoonfuls of the chicken mixture into the hot broth. I was expecting it to all fall apart once it hit the liquid, but to my surprise it stuck together. I left it to boil for around 15 minutes, and turned off the heat. Here is how it looks like when done. I really love this because it’s quite easy to make, and you can put as much carrots as you want in it. It also keeps well in a baon container and reheats nicely in a microwave. Back when I was still bringing baon to work this was one of my favorite things to make. I can’t believe I’m at the finish line of this very interesting challenge! Today I am supposed to take a similar full-body photo of me three months ago, and compare it to a similar one today. Here’s my comparison photo. 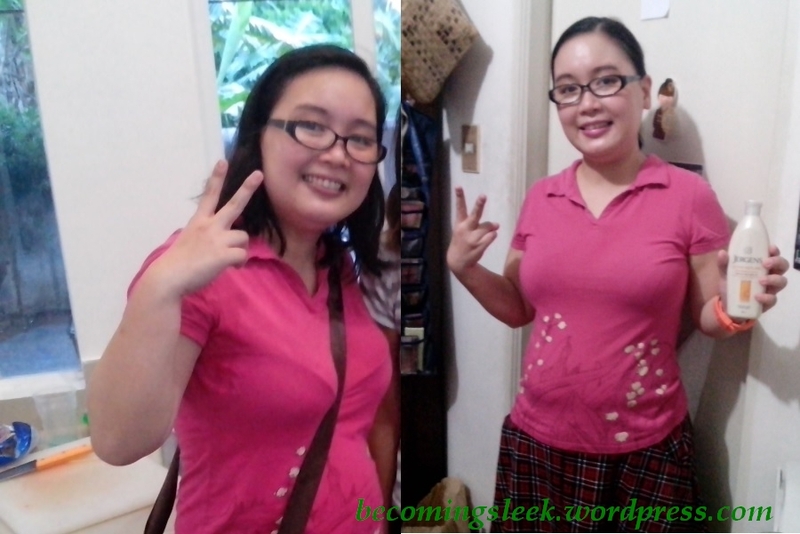 It wasn’t really my intention but it turns out I wore the same shirt even. I really like how my skin looks more radiant and feels more smooth with the constant use of Jergens Ultra Healing Lotion. I also feel more confident after completing this challenge. Thank you Jergens and Vibelle for letting me participate! Connect with Jergens on Facebook, Instagram, and Twitter by simply clicking on the links I’ve provided. It’s pretty easy to get jaded by contests recently, I agree. This one I joined because it was different enough and seemed to have heart as you said. It’s challenging though!